One of my favorite boating trips on Lake Winnipesaukee is to cruise over to Wolfeboro. Sometimes its a rough ride crossing the broads other times it's nice and smooth. If it's really hot, we stop behind the Barn Door islands and swim. I prefer going to Wolfeboro on a warm, late summer day when it's not too hot. Usually, we go under the bridge and into Back Bay to dock. It's quieter and easier to find a place to dock the boat. Sometimes we just get an ice cream and sit and relax in the warm sun. 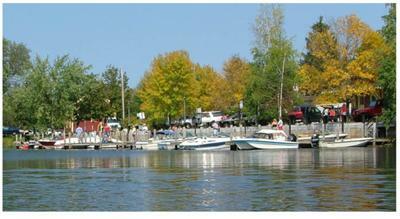 Other times we walk around the downtown area, check out the shops and look at other boats docked in Wolfeboro Bay. Even though Wolfeboro is a small town, I feel like we went somewhere big. You can spend hours there and feel like you've accomplished your goal of doing something for the day without that rushed feeling of trying to see everything in one day. I look forward to going to Wolfeboro each and every summer. A number of other people like to go there as well, because we always run into someone we know. Join in and write your own page! It's easy to do. How? Simply click here to return to Favorite Lake Winnipesaukee Boating Cruise.